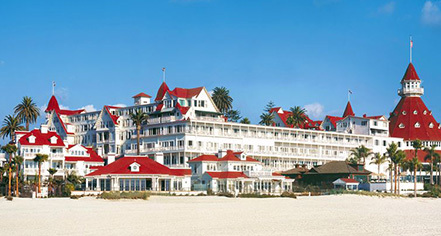 On March 19, 1887, Hotel del Coronado held a Groundbreaking Ceremony to introduce the Reid Brothers of Evansville, Indiana, the architects for the project. Construction was completed in the early winter of the following year. Guests began to arrive in January 1888, but the first meal in the Crown Room was served on February 19th, which is why that is widely considered the hotel’s birthday. A living legend for 130 years, The Del celebrates its rich history as a proud host to celebrities, royalty, and beach-loving families through timeless experiences that resonate with modern-day guests. Rated one of the top ten hotels in the world by USA Today, The Del offers a contemporary beachfront experience, ocean view dining, an award-winning spa, upscale shopping, and a variety of recreational activities. For personalized service and luxury beachfront accommodations, Beach Village is a private enclave set within The Del. Hotel del Coronado was designated a National Historic Landmark by the U.S. Secretary of the Interior in 1977. Considered by many as one of the most beautiful resort destinations in the world, the Hotel del Coronado is the quintessential Coronado, California hotel resort destination on the beach. Nestled on 28 stunning oceanfront acres, The Del is conveniently located just across the bay from downtown San Diego and its many attractions, and only a 15-minute drive from the San Diego International Airport. 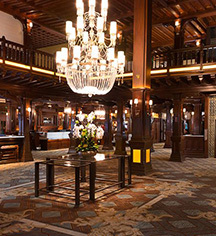 Hotel del Coronado, a member of Historic Hotels Worldwide since 2018, dates back to 1888. In 1958, The Del was the setting for the #1 comedy of all time according to American Film Institute: Some Like it Hot, directed by Billy Wilder and starring Marilyn Monroe, Tony Curtis, and Jack Lemmon. Cancellation Policy: Cancellation policies may vary depending on the rate or dates of your reservation. Please refer to your reservation confirmation to verify your cancellation policy. If you need further assistance, call the hotel directly. Early Check-In/Late Check-Out: Early Departure Fee: $75.00 There is a $75 fee if you check out prior to your scheduled departure. Late Check-Out Fee: $0.00; After 4pm the late check out fee is a half day rate. Hotel/Resort Fees & Taxes: Daily Resort Charge will be added to the room rate and includes: Guest internet access; unlimited indoor fitness classes and beach yoga; live streaming of Netflix, Pandora, Hulu, YouTube and Crackle; discount tickets to Legoland, USS Midway and whale watching tours; local and toll-free calls. Parking: Parking is available on site. Self-parking: $39.00. Valet: $49.00. Secured, with In/Out Privileges. Payment: Visa, MasterCard, American Express, Diners Club, and Discover are accepted. Pet Policy: Service animals allowed: Yes. Pets allowed: Yes. Deposit: $125.00 (non-refundable). Maximum Weight: 40 lbs. Other Pet Services: Pet-walking and pet-sitting. Transportation: To arrange for private car transportation, please contact LaCosta Limousine at 1-888-299-5466. Approximate taxi fare from the San Diego International Airport to Hotel del Coronado is $30 each way. Approximate one-way taxi fares to popular San Diego destinations: Zoo – $25, SeaWorld – $40, Downtown/Gaslamp – $25, La Jolla – $75, Legoland – $120, Safari Park – $130, Coronado Ferry Landing – $8. You may also contact Del Concierge for assistance at concierge@hoteldel.com or 1-800-HOTEL-DEL. On March 19, 1887, Hotel del Coronado held a Groundbreaking Ceremony to introduce the Reid Brothers of Evansville, Indiana, the architects for the project. Construction was completed in the early winter of the following year. Learn more about the History of Hotel del Coronado .